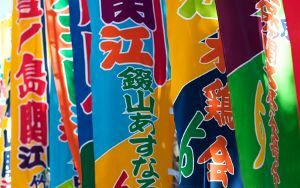 This is the first of a few articles introducing the way Japanese people communicate with each other. They won’t teach you how to read, write or speak Japanese but they should hopefully be enlightening for people with no previous knowledge. Let’s kick off by looking at the alphabets (yes, plural) that Japanese people use. The thing that attracted me to Japanese was not manga, anime or robots like many others. It was sumo wrestling and squiggles. On first sight, Japanese looked liked random squiggles but the thought of being able to glance at it and actually know what’s written seemed so cool. I’d be like a spy cracking a secret code! Even now, many years later, I still get a thrill from seeing a bunch of squiggles and understanding (most of) it. Japan is still a pretty sexist country but 1,300 years ago it was much worse. Women were only allowed a lower level of education than men so consequently didn’t use the thousands of Chinese characters (kanji) that men did. Instead, they started using a cursive, simplified form of a handful of kanji to represent sounds and ignored their meaning. For instance, to write kumo (cloud), they could have used derivations of 久 (long time) and 毛 (hair, fur) which, over time, became the hiragana く (ku) and も (mo). This spread from ladies of the imperial court so that eventually men also used hiragana for unofficial writing. It’s now the foundation for reading and writing in modern Japan so if you only learn one Japanese alphabet, make it hiragana. Collectively known as kana, hiragana and katakana are phonetic alphabets and it’s no coincidence that they both have exactly the same number of characters (48) — they each have the same pronunciation and sometimes even look similar. For example the hiragana か (ka) is ヵ (ka) in katakana. This can be confusing but katakana are easy to spot because they look very angular whereas hiragana have curves. But why have two similar alphabets at all? Good question. Katakana developed at about the same time as hiragana but are now used when writing foreign words primarily from Western cultures, such as ロケット (roh-ke-tto) for rocket. They are also used for onomatopoeia and for adding emphasis or a “cool” factor. For example, the word for fashionable is オシャレ (o-sha-re) which, despite being an originally Japanese word, is often written in katakana to seem, well, fashionable. The two characters for the word kanji (漢字) mean “Chinese character” and that is indeed where they came from. Korean also uses various Chinese characters but because of a decree by Mao Zedong in the 1950s to simplify characters to improve literacy in China, modern Chinese characters (except in places such as Taiwan and Hong Kong) can be quite different to those found in Korean and Japanese. Pronunciation is also a little complex. Some kanji retain their sound from Chinese, e.g. three (三) is pronounced san both in Mandarin Chinese and Japanese. Some have evolved slightly over the centuries, e.g. famous (有名) is you-ming in Mandarin Chinese and yuu-mei in Japanese. In other cases there seems to be no similarity. And as if that’s not enough, each kanji has at least two correct ways of pronouncing it in Japanese. More about that in a later article. But despite these challenges and having thousands of them to learn, for me, kanji are the most beautiful aspect of the Japanese language both in their form and their logic. They range from very simple to very complex and can be works of art in themselves. Some are figurative, for example the character for tree (木) looks sort of like a tree, and some are clearly abstract. Characters can be combined to make a more complex character and can be chained together, most commonly in pairs, to make words. Let’s see a quick example of this. The kanji for sun is 日 (pronounced hi, ka, nichi or ni). We’ve already met the kanji for tree (木) but if we add a small line at the bottom to make 本 it now means root or origin (or book, incidentally). If we chain these two kanji together we get 日本 (ni-hon) meaning origin of the sun, or land of the rising sun, i.e. Japan. Adding the delightfully simple kanji for person (人) to the end gives us 日本人 (ni-hon-jin), meaning Japanese person. Is there an “alphabetical order” for hiragana and katakana? Yes. The hiragana/katakana order sounds like this: a i u e o, ka ki ku ke ko, sa shi su se so, etc. Notice a pattern? Is there an “alphabetical order” for kanji? Not really. They can be ordered by their number of strokes (how many lines each one has) and there’s also a fixed order that children learn them in at school. Speaking of which, at what age do children learn the alphabets? 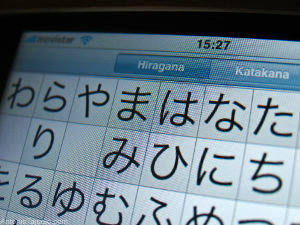 Hiragana and katakana are learnt first at around age five or six. Children then spend several years learning the kanji — 1,006 in elementary school and another 1,130 in junior high and high school. How do children learn them all? Are they geniuses? Hah, they wish! They have to sit and memorise and test and moan just like kids all over the world. Is there an ABC song equivalent? Unfortunately not. Feel free to write one. The Wikipedia articles for hiragana, katakana and kanji are a good starting place for learners. For efficient learning, I recommend Anki and some of the freely available card decks. The undisputed champion of online Japanese dictionaries is Jim Breen’s WWWJDIC. This entry was posted in Japanese and tagged education, Japanese, reference on 7 June, 2013 by Daniel.